Today we've got YA Urban Fantasy author, Tawdra Kandle, giving us the scoop on Tasmyn. The main character from The King Series. One of the possible panels at the Olde City, New Blood convention is about lead character variety and competing with Vampires and Shifters. We thought it would be fun to do a little preview of that! 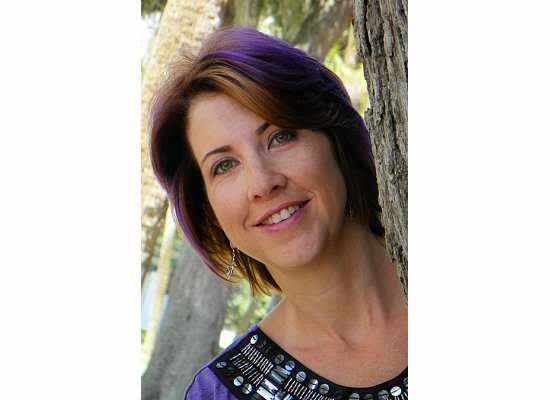 Bio: Tawdra Kandle is the author of THE KING SERIES, a young adult urban fantasy quartet. Born in South Jersey, Tawdra published her first short story at the age of 13 in Child's Life magazine. During the early years of her marriage and motherhood, she wrote articles and columns on parenting and homeschooling, as well as some homeschooling curriculum. THE KING SERIES is her first published full-length fiction. Tawdra currently lives in central Florida with her husband, and children, both skin and fur types. And yes, she has purple hair. Demons, and Witches, and Warriors, Oh My! - Lead character variety - why it's important, and how to compete with vamps & shifters. I could say that I looked at the market, did some demographics, determined that vampires and shifters had reached their saturation point and so decided to make my main character a witch. But that would not be true. In fact, the main character in my young adult series came to me as all of my people do—fully formed. I wouldn’t have termed her a witch, per se, although it was clear that she was shortly to meet some fascinating women who fell into that category. At this point in her story—at the end of the third book—Tasmyn may very well be called a witch. I am a fan of most kinds of supernatural beings as they are portrayed in fiction. It’s interesting to see how different authors present their supes: as vicious predators, as misunderstood victims or as sparkly heartthrobs. And as an author, it’s always tempting to jump on the next bandwagon. But it’s important for us to be true to our own artistic and creative callings. It keeps the bookstore shelves balanced. I knew from the beginning that I wanted to write urban fantasy, the type of story that juxtaposes an extraordinary person or situation with normal, everyday life. I didn’t feel called to create a new world or people my book with all different kinds of supernatural beings. The whole point of The King Series is the contrast between Tasmyn’s gifts and the world around her. . .and on a larger scale, that of the town of King with the so-called ‘real’ world. And so on that level, I don’t feel that my books necessarily compete with vamps and shifters. It’s a different mythology, and I believe a good story trumps all the rules and theories. After all, there’s plenty of room for all of us. . .demons, witches, vamps, angels, shifters. . .maybe even an alien or two! Congratulations on reaching 800 followers! Gotta love those even hundreds.